The home now known as the Frankie House at 1257 Third Avenue SE was built in the 1890s in Wellington Heights, one of Cedar Rapids’ oldest neighborhoods. Once slated for demolition, we’ve moved this historic gem to a new lot in the neighborhood and are rehabbing it as part of a unique partnership. The goal is to eventually sell it as affordable housing. John F. Kuba appears to be the original owner of the home, which was built in the late 1800s. The Kuba family came to the United States from Bohemia and arrived in Cedar Rapids in 1869 when John was still a child. He and his brother later worked for the Burlington, Cedar Rapids and Northern (BCR&N) Railway, and then for the Rock Island Railroad. Kuba likely rented the house to its first tenants, Dr. Frank Woitishek and his wife, Josephine. Frank Woitishek was the son of Linn County pioneer Joseph Woitishek, who became a merchant and grain dealer in Ely after immigrating to the United States from Bohemia. Frank Woitishek was recognized for his research into the high number of suicides among Bohemians in the late 19th and early 20th centuries. His sisters were prominent Cedar Rapids club women; one was a teacher, and one managed her father’s farms. The story-and-a-half, two-bedroom home was one of the first constructed on the block. 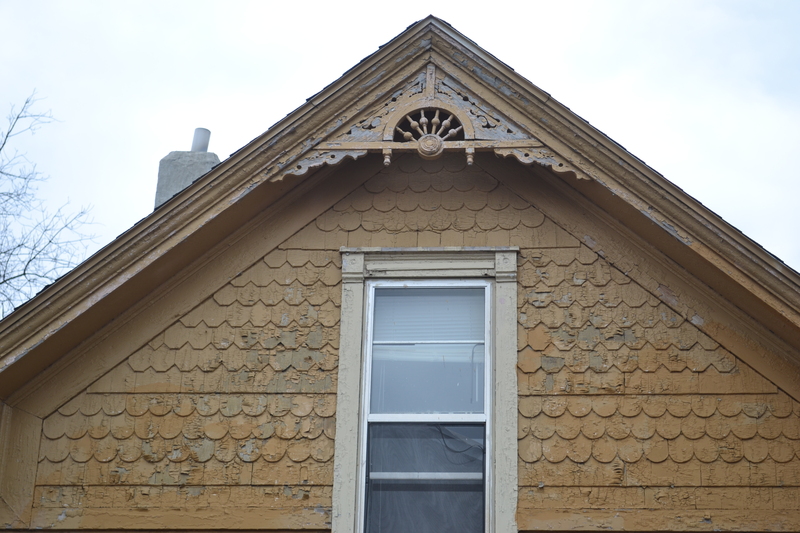 It still retains its original gingerbread trim and other architectural features, making it historically significant, according to Mark Stoffer Hunter, a Cedar Rapids historian and member of Save CR Heritage. It sits just three doors down from the childhood home of former first lady Mamie Doud Eisenhower and is eligible for the National Register of Historic Places. The Woitisheks lived in the home for only a few years, but the house stayed in the Kuba family through 1977 with various renters, including other employees of the railroad and various members of the Kuba family. The home was purchased by Westminster Presbyterian Church more than a decade ago. When Westminster officials found they could no longer afford upkeep on the home, they took out a demolition permit, planning to create green space. Members of the city’s Historic Preservation Commission put a 60-day hold on the demolition in hopes of finding an alternative. Recognizing an opportunity, we knew the home could provide an ideal model of preservation through relocation. Led by board member Emily Meyer, we jumped into efforts to study the costs involved. In a first-of-its-kind effort, we were able to orchestrate a unique collaboration to make the move a reality. The Westminster Presbyterian Church agreed to sell us the home, provided it would be moved. But finding a suitable lot was no easy task. One owned by the Affordable Housing Network Inc. at Fourth Avenue and 15th Street SE was deemed too small for the house. A request to the Wellington Heights Neighborhood Association, though, provided the key element to make the move feasible. A lot owned by the association at 1425 Fifth Avenue SE was large enough, but it was being used as a community garden. The association agreed to donate it to us, and in turn, the Affordable Housing Network donated their smaller lot to the neighborhood association, which relocated their garden to its new location. The cooperation of the two organizations was a critical turning point for the project. While we were making these arrangements, the 60-day hold expired. But the church agreed to hold off on the demolition so we could follow through with the proposed move. They also offered the house to us for a nominal fee of $10 if the move proved feasible. In July, the Frankie House project got a boost from two volunteer groups. First, a dozen AmeriCorps volunteers removed debris from around the outside the house. They later moved inside to remove suspended ceilings, lighting fixtures, and floor and wall coverings that had been added to the house over the years. Later in the month, AmeriCorps NCCC members spent a day removing old paint to prepare the house for its new coats before its relocation. D.W. Zinser Co. of Walford, the company Westminster had contacted to raze the home, also donated its services. This time, instead of a demolition, they backfilled the hole where the house once stood when it moved to its new location to give Westminster the green space they were seeking. Trees Forever is working with the neighborhood and Westminster to replace trees removed for the home to make its move. Alliant Energy donated the crews to relocate wires for the move. And Fosters Heating & Air Conditioning of Marion pledged to donate a new furnace and air conditioning system for the house. We’re grateful for all the volunteer efforts, donations and in-kind contributions for this project. If your group would like to donate or volunteer to help with the restoration, let us know. Moving Frankie House to its new lot was a big project, even though its destination was only a few blocks away. On September 16, 2015, Aylsworth House Movers of Wadena successfully transported the house from its original location to a staging area next to its new lot. The move took nearly half a day to complete. Watch our video to see just what goes into moving a 120-year-old home. Digging the basement at the new location is now complete, and the foundation has been poured. We expect the house to be set on the new foundation soon. We expect total costs to approach $120,000, including $20,000 for the cost of the move itself. The Frankie House campaign is named to honor the Woitisheks’ 3-year-old daughter Frankie, who died in the home in 1898 of an illness, and to recognize the history of the home. A bank loan. Cedar Rapids Bank & Trust loaned us the funds to bridge the gap between our purchase of the house and the sale to its eventual owner. Grants and tax credits. Save CR Heritage is seeking historic tax credits to offset our expenses, and we’ve applied for grants from local and state sources. We were chosen by the City of Cedar Rapids as a ROOTs program project, providing further financial assistance. Our own assets. We’ve invested $20,000 of Save CR Heritage’s assets in the move. Public support. Since our inception, we’ve received donations from the community to support projects such as the Frankie House. We continue to rely on donations from generous supporters like you. Please note that donations to Save CR Heritage are tax-deductible. Make a donation now. Want to keep up on our progress? Sign up for email updates. Want to know more? Send us your questions. Want to get involved? Help us save one of Iowa’s historic gems and provide affordable housing in one of Cedar Rapids’ oldest neighborhoods.